It was 99 degrees last night in Chicago and everyone, everyone, was wondering when the power grid would succumb to the demands of so many chillers, air conditioners, heat exchangers and fans. A Star Trek engineer might mistake this handheld and battery-powered device for an interdimensional three-core phase disrupter. It’s sleek, points like a triggerless weapon, has tiny controls and shines a colored light at targets. If only there were sounds…. The Thermal Heat Detector isn’t much different from similar devices used to gauge meat temperature on the grill. 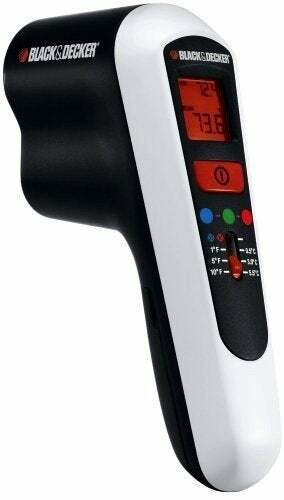 Point either at your target and it will remotely measure the surface infrared heat of that point. 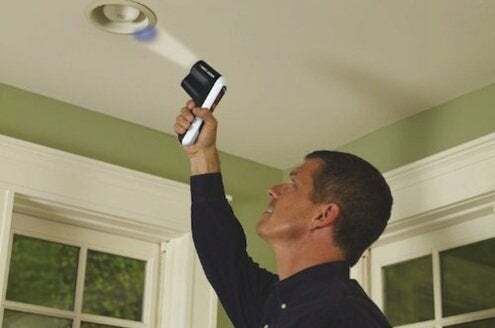 You could buy a detector and run around documenting temperature deviations of every joint, jamb, and joist in your home (driving yourself nuts in the process). Or you could get Black & Decker’s tool, which is specially designed to find temperature differences along household surfaces. While it does display actual temperatures, the Thermal Heat Detector’s real utility hinges on how its colored beam changes based on how much one area differs in temperature from another point you’ve chosen as a basis of comparison. Everything reading the same temperature as the reference spot is green, cooler is blue, and warmer is red. And you can choose the detector’s sensitivity, too. Choose one-degree differences and you’ll find where the family dog was just sleeping. But setting the tool for five- or 10-degree deviation is more than a little helpful in finding leaks. The goal in the summer, as in the winter, is to find air leaks that are costing you money. Of course, How you go about plugging those leaks is another, more complex, matter.